Elisabeth Harvor was born on June 26, 1936 in Saint John, New Brunswick. Her parents were Danish potters who spent most of their lives in northern Europe, but moved to Canada for hopes of a better life. Harvor left home at seventeen and went to medical school, later dropping out after realizing it was not her calling. She married in 1957 and raised her two sons in Ottawa, all the while reading as much as possible. In 1981, after she was divorced and her children had left home, she moved to Montreal and enrolled at Concordia University where, in 1986, she earned her M.A. in creative writing. 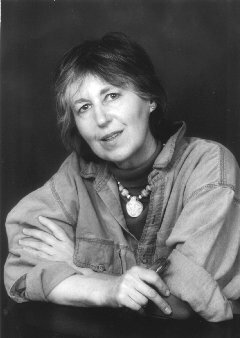 Since completing her Master’s Degree, Harvor has been a very successful author, having published short fiction, books of poetry, and novels. Her first poetry collection, Fortress of Chairs (Véhicule Press, 1992), was the co-winner of the Gerald Lampert Memorial Award in 1993. Let Me Be the One (Harper Collins, 1996), a collection of short fiction, was a finalist for the Governor General’s Literary award in 1996. The Toronto Star named her first novel, Excessive Joy Injures the Heart, one of the top ten books of the year in 2000. She has also received the Alden Nolan award (2000) and the Marian Engel award (2003) for her impressive body of work. Poem: "Do you live alone?" some stranger asks you Do you live alone? at the exposed nape of your neck. sleight-of-hand of life in the city. dying. To be home again! in the sweet steam from a cup of green tea. the wall of the question Do you live alone? Published in Fortress of Chairs (Vehicule Press, 1992). Brianna Parker (Advanced Poetry Workshop) and Monica Grasse (ACPA Managing Editor, 2016). Elisabeth Harvor’s sharp eye and understanding of seemingly mundane experiences makes her work vivid and often hits close to home. “Do You Live Alone,” like many of her other poems, is a snapshot of a life laced with personal touches and uneasy thoughts. The poem unfolds as a narrative brought on by the reflections of a woman being asked a distressing question: “do you live alone?” (2). The eponymous question provokes a child-like hope and a weary looking future stemming out of loneliness and characterizing the struggles of identity and shame that one finds when constantly balancing their reality with societal expectations and personal feelings. As the question is repeated, readers explore the dichotomy of loneliness as Harvor presents both its benefits and downfalls. “Do you live alone” is a study, recognition, and acceptance of a certain kind of sadness. The structure of the poem perfectly outlines this theme, giving readers the impression of falling, particularly with the narrator as she comes closer to the roots of her sadness. This is not a sudden or jarring fall, but rather a slow and willing descent enforced by the short lines and noticeable, consistent spacing. In order to come to a conclusion about the posed question, the narrator re-examines feelings that she is perfectly aware of but does not often admit. Sprinkled through the verses are line breaks that bring about several play-on meanings: “pocked with hard dirt flung by cars racing/daylight and you in your high boots and short gloves” (25-26). Here, each line can be read separately, but when read together, they create a new meaning. Specifically, the “racing cars” signify the author’s understanding of life passing her by, but the addition of “daylight” in the next line defines the cars as passing something other than herself. The narrator’s enjambment indicates her unwillingness to fully direct her attention towards her feelings of loss provoked by the passing cars. The structure of “Do You Live Alone” creates support for the poem’s purpose. The lines open with a woman trying to answer the question, but ultimately stumbling because she wants to give the perfect response. Readers are therefore given the first hint of the narrator’s loneliness, which is finally explained as stemming from her relationship with men: “the one answer and no other,/as long as you both – both you/an your aloneness – shall live” (8-10). Recognizing the wedding vows, readers will understand that the woman feels that see is tied – ‘til death do us part,’ to finish the popular vows – to her loneliness, already showing how dimly she paints her future. This idea of marriage demonstrates her awareness of isolation, but her overall hesitancy to admit it. Though implied, marriage is not forwardly stated as a means of escape from her mind, but helps explain her feelings of worthlessness and how she has “used up” her bright outlook on the future and her life in her youth (19). Much like the wedding vows, Harvor sprinkles images of nostalgia throughout the poem as a way of demonstrating her conflicting feelings. This is best shown in her winter scene: the snow, blackened by cars and “soot” (24), and “Christmas lights” (28) hanging only over the houses of people lucky enough to be “in love,” (32) paint a picture of the tainted pure and how luxuries are only given by chance. The cold imagery is carried to a chilled subway station where the woman is asked the famous question by an intimidating man. With a heavy heart, she muses on the idea that this man is the price she has to pay for losing her pervious loves; she is impure, and love seems like something that she will never find again. She is invasively followed by this man (much like her constant dark thoughts), but escapes by sitting next to a woman and baby on the train. Once out of danger, the narrator is thrilled, yet is paradoxically left – along with readers – with the lingering threat of what “Do you live alone” could mean (2). This harshly contrasted imagery forces the narrator to question whether living alone only invites an invasive, gloomy type of lifestyle, or something happier. The line “You will smile too as if in throwing/your sad pursuer off the scent you have outwitted/dying” (81-83) does exemplify her gleefulness at escaping a bad situation, but also characterizes her escape as a game. Again, something once innocent is turned into to something cruel, and she does not know how to accept that reality. The poem nears its end as the woman reaches her home, where she is happy for the safety that loneliness brings. Yet, she also notes the down side of this solitude: “wrapped up solemn and high/in all your aloneness like some dignified female” (90-91). This is a nod to the shame that some may feel after admitting their loneliness, especially from one who is supposed to be “dignified” like a woman of her age (91). The poem therefore concludes with Harvor’s acknowledgement that no matter how the question “Do you live alone?” is posed, the answer will always be answered in a truth that covers her conflicting, uneasy, and lonely feelings (2). Harvor, Elisabeth. Fortress of Chairs. Montreal: Vehicule Press, 1992. Print. Harvor, Elisabeth. All Times Have Been Modern. Toronto: McClelland & Stewart, 2004. Print. ---. "An Animal Trainer Urging a Big Cat Out of Its Cage." Prairie Fire. 37.2 (2016): 58. Print. ---. An Open Door in the Landscape. Kingsville: Palimpsest Press, 2010. Print. ---. A Room at the Heart of Things: The Work That Came to Me: an Anthology of New Writing. Montreal: Véhicule Press, 1998. Print. ---. Excessive Joy Injures the Heart. Toronto: McClelland & Stewart, 2000. Print. ---. Fortress of Chairs. Montréal: Signal Editions, 1992. Print. ---. If Only We Could Drive Like This Forever. Markham: Penguin Books Canada, 1988. Print. ---. Interview by Krista Bridge. Books in Canada 31:5 (2002): 11. ---. "Invitation to a Circumcision." Malahat Review. (2016): 85. Print. ---. Let Me Be the One. Toronto: HarperCollins, 1996. Print. ---. The Long Cold Green Evenings of Spring. Montreal: Signal Editions, 1997. Print. ---. Our Lady of All the Distances. Toronto: HarperCollins, 1991. Print. ---. "Two Pairs of Eyes." Fiddlehead. (2011): 6. Print. ---. Women & Children. Ottawa: Oberon Press, 1973. Print. Harvor, Elisabeth, ed. A Room at the Heart of Things: The Work That Came to Me: An Anthology of New Writing. Montreal: Véhicule Press, 1998. Print. Harvor, Elisabeth, and Colin Morton. The Long Cold Green Evenings of Spring. Arc. (1998): 73. Print. .
Harvor, Elisabeth, Elyse Friedman, Pearl Luke, and Sara Jamieson. "Three First Novels: Then Again, Burning Ground, Excessive Joy Injures the Heart. Canadian Literature (2003): 147-149. Print. Harvor, Elisabeth, and Kitty Hoffman. All Times Have Been Modern. Malahat Review (2005): 95-96. Print. Literature. (1990): 336-338. Print.Greco, Heidi. “Let Me Be the One.” Paragraph 21 (1997): 34-35. Print. Kirchhoff, H.J. “Harvor Returns with Roar After Prolonged Silence.” Globe and Mail [Toronto] 16 Feb. 1988: C8. Print. Kruk, Laurie. "A Humiliation a Day: Elisabeth Harvor in Conversation with Laurie Kruk (interview)." Antigonish Review (1992): 143-162. Print. Kubacki, Maria. “Excessive Joy Injures the Heart.” Rev. of Excessive Joy Injures the Heart. New Brunswick Telegraph-Journal 30 Sept. 2000: R6. Print. ---. “Not the Beth of Little Women.” Interview with Elisabeth Harvor. Books in Canada 27.4 (1998): 4. Print. Leggat, Alexandra. “In Which Kay Learns About Love.” Rev. of All Times Have Been Modern. The Globe and Mail [Toronto] 18 Sept. 2004: D17. Print. Monteith, Stacey. “Elisabeth Harvor.” New Brunswick Literary Encyclopedia. Spring 2010. Web. 31 May 2016. Pacey, Tish. “Harvor’s Latest is an Extraordinary Novel.” Rev. of All Times Have Been Modern. The Daily Gleaner [Fredericton, N.B. 06 Nov. 2004: B7. Print. Secondary Sources Provided in part by the New Brunswick Literary Encyclopedia.